Classic monsters are so much fun! They’re easily recognizable and quick to create costumes for. Due to original source images generally being from very old movies, and having been portrayed in so many forms over the years, they allow for some artistic freedom. While everyone can recognize that this is a mummy costume, no one is going to hassle you about the specifics. Assuming you care about such things. 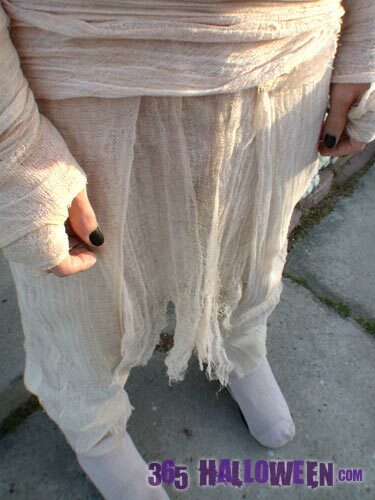 Materials used to outfit a 6’2" individual: Gauze (about 8 yards minimum), black tea, underclothes (several yards cotton muslin fabric + elastic), pair of socks, Halloween makeup kit, black nail polish. 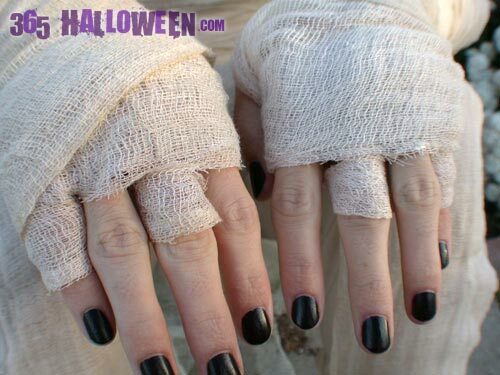 After purchasing (off the bolt, not pre-packaged) yards of gauze from Joann fabric store, the first step was to dye them in black tea to give them an aged look. Simply brew up a strong batch of black tea, wait until it cools, and dip your gauze in it. The color soaks up immediately so there isn’t much need to let it sit around. Wring the gauze out and let it air dry completely. Give it another dip if you want darker color, and/or drizzle some of the tea over a few areas so that the color isn’t so uniform. Since the gauze is rather, well, gauzy, we need a layer of clothing underneath. I chose the quickest and cheapest method, second only to buying underclothing at a thrift store. Using beige cotton muslin fabric (terribly inexpensive stuff) I made a pair of elastic waist pants that were as form fitting as possible, given that muslin has no stretch to it. The tunic top is cut sort of like a muscle shirt but one of the sides has several bits of elastic so that you can slip into it. I thought this would be easier than using a zipper or buttons and smoother than using ties, and would also allow for some more movement. I didn’t use patterns, but if you’re an unsure sewer than you can find simple pants and top patterns at any fabric store. Look for pajama, medical scrubs, or Halloween costume patterns. A white thermal top was worn underneath this for added warmth and coverage. The pants have a few layers of gauze sewn on with large basting stitches. Just enough to cover the entire sides of the pants and the front and back to just past the knee. This gives a good amount of coverage but allows for movement and doesn’t use much gauze. I did some strategic tearing of the hanging gauze so it didn’t look so new and geometric. If you wanted to be really quick about this and don’t mind spending more money, a pair of white sweat pants and a thermal top could be dyed with brown fabric dye. To cover shoes we used a pair of beige socks and cut a slit on the bottom. Not the prettiest, but it works! Wrapping the gauze over the underclothes takes patience and experimentation. We started with the head, then the arms, hands, midsection, and shoulders, trying to cover all the gaps inbetween sections. The more gauze you have, the easier this will be and the better it will look. This is probably the bare minimum you could get away with and not have a crappy looking mummy. Makeup came from a Halloween makeup kit containing green and yellow. We started with a layer of yellow on all exposed areas of the face except for the eyelid and directly around the eyes. We lightly filled those in with dark brown eye shadow and put on a smudgy line of charcoal eyeliner on top. Finally, highlights of green were added around the eye sockets and black nail polish was applied. Isn’t Sean the prettiest, most gentle mummy you have ever seen? 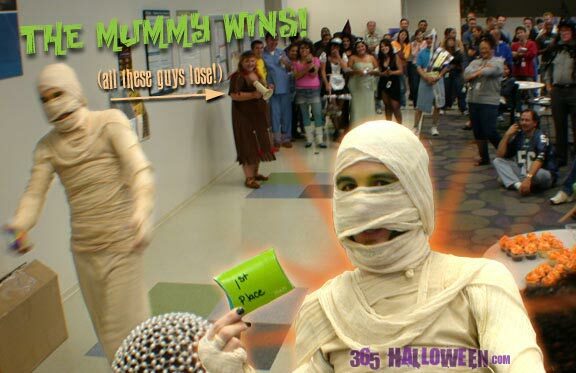 Grown ups really don’t try that hard when making their costumes, so it was no surprise when Sean the Mummy (aka Sean of the Dead) won first place in the costume contest at his work. At the time he worked for a large company (about 200 peeps at that location) and everyone loved his getup. $50 prize money paid for the costume supplies and then some. He said driving to work was particularly fun because it made so many people look twice and children were quite surprised to see a mummy driving an old Plymouth down the 405 freeway. He also spent the day in character, answering mostly with variations of “RAAAAAR!” and “Mummy go on break” type broken English. One of the most frequent questions he got was “how do you go to the bathroom”, because I guess everyone assumed he was actually all wrapped up. If you sewed guaze onto the pants like we did then all you have to do is unwrap the layer of guaze that goes around your waist, do your bidness, and easily rewarap. Anyway, I hope the instructions were helpful and that all you prospective mummies have a great DIY Halloween! 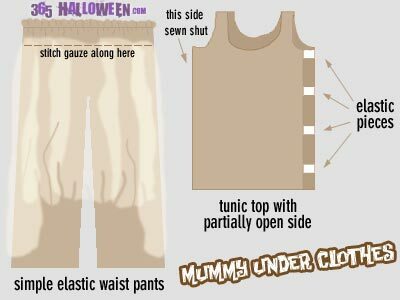 create your own Mummy Costume. Subscribe to comments with RSS or TrackBack to 'Mummy Costume'. Thank you SO MUCH for this! My son wanted to be a mummy this Halloween and I didn’t know where to start. You made this really easy for me! Thanks for the great idea about the socks over the shoes! My son has a great mummy costume but I was stumped on what to do for shoes. Since I have already used the tea stain with great success on the body of the costume, I am going to do this with a white pair of large socks as well. My son wants to be a Mummy this Halloween and has been talking about it all summer. Thanks for the tips. Great information. My husband won 1st prize at a Halloween party. My only complaint – it took at least 3 hours to wrap him and I bought 18 yards of fabric. I could have used at least another 10. Great costume!!!! Love the socks idea for shoes. I found that if you put sandals on, then put a knee high white socks on. If you wear medium, get large so they can slide over the sandal/feet and rest comfortably on your ankles/calves. Very cool brother! You’re the best mummy ever, except of course when I’m a mummy! Thanks for the tutorial! I made a mummy costume for my almost 2 year old son. I also made him a little headpiece/hat as well as shoe covers. I think it turned out great, although I’ll be happy to not look at cheesecloth for awhile. My daughter whom is 9 made a mummy outfit for my work party… thanks, she won… she loved it and so did every one else. everywhere i go is so expensive, and they don’t carry it at the site u gave anymore. how can i find somewhere with cheap gauze? 365 Halloween Response: Some supplies definitely get more expensive as Halloween draws closer, with prepackaged gauze/cheesecloth being one of them. Look for this material by the yard, not in a package, and you will get a better price. The stock at individual Joann stores will vary, and isn’t always the same as on the website. If Joann.com does not carry cheesecloth/gauze by the yard, try calling your local Joann or other craft store to see if they have it. this will be so helpful ! thanks!!! 365 Halloween Response: It probably depends on what store you go to, but cheesecloth and gauze are probably considered the same product. If your store only has “cheesecloth” by the bolt, then go for that. Good luck on the Mummy and Me costumes! hi! I love the tutorial, but for my mummy costume I would like it to be a bit more greyish, what should I use to get the gauze more grey? 365 Halloween response: Adding some gray sounds like a good addition that would add depth to the brown color added by the tea. We suggest using about 1 teaspoon of black acrylic paint (you can get a bottle for $1 at any craft store) with 1/2 cup of water, to form a very watery gray solution. (Definitely play with the ratio to suit your desired level of gray.) Add gray accents by using a paint brush to apply the solution directly on the gauze. 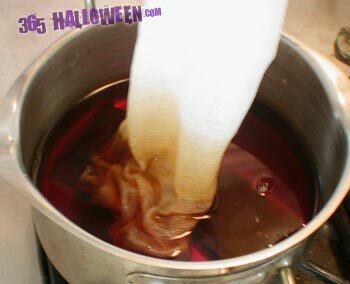 Or add an overall gray affect by dipping the gauze into the solution just like you would with the black tea. Good luck, and let us know how it turns out! i was wondering how wide the gauze was? Was it 2 inches wide? There is so many different kinds out there and was just wondering what you had used. Thanks for the listing and all the info! 365 Halloween response: Good question. I just updated the page to try and clarify, but we used gauze that was cut off a fabric bolt. That may come in various sizes, but I believe it was 45″. (That’s the most common size for bolt-cut materials.) Anything thinner, such as the stuff sold in drug stores that’s only a few inches wide, will definitely be too small. You want the gauze as WIDE as possible to help fill in any gaps between layers. What did we tell you about this being an award winner? See the 1st prize costume that came from this tutorial. It seems like fun… but I would consider adding flameproofing to the black tea, although this is presumably not as dangerous as toilet-paper mummification. It depends on how well you wring it out, but if you lay it out in single layers it definitely shouldn’t take more than an hour. Thanks for the compliments, and don’t forget to send in pictures or post a link to pictures of your mummy costume. Your site is really great! I was just wondering, roughly how long does it take for the guaze to dry after you dip it into the black tea? No, I don’t feel it was annoying to have my face covered all night. In fact I wore it for an entire 8-ish hour workday when I participated in the contest with no big problems. It was fun to have an excuse to wear a costume for an entire day. Plus it’s soft gauze that moves with you and is very breathable. Good luck on your creation. Come back and let us know with pictures how your mummy costume comes out. i was looking for a good tutorial on a decent mummy costume. was it annoying to have your face covered all night? I don’t think I’m going to wrap up my face.